This is a wonderful interview with Tim Huet, co-founder of Arizmendi Cooperative in the San Francisco Bay Area. We participated in a workshop on worker cooperatives with Tim about 14 years ago. Not only is he a talented group facilitator, but he has devoted his life to help start and sustain cooperatives. The interview is also a testament to the idea that if you do what you love before you start a romance, the romance might come about through your work. 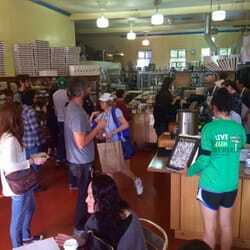 Arizmendi Bakery is an extremely successful coop. We bought pizzas there for many years when we lived in Oakland.